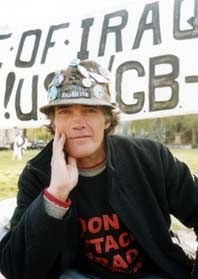 Brian Haw has spent the past four-and-a-half years encamped outside London Parliament to highlight the plight of Iraqi children. Arrested once more yesterday as a law has passed that forbids spontaneous free speech within a one-kilometer radius of the House of Commons, Brian Haw told the policemen: "I'm not breaching the peace. I'm fighting for it." He was released a few hours later as his crime - the fact that his sleeping bag was within shouting distance of the Prime Minister's bedroom – started before the law came into force and the High Court judges ruled that he was exempt from the ruling. Despite the High Court decision made in July, police are still “harassing” him, but he is back in Parliament Square today, keeping a vigil as he has been doing it night and day since June 2001. The Prophet RAEL said today that he is a model for the whole of Humanity. Instead of living a selfish life, not caring for others, and for the crimes perpetrated by governments of the so-called "free world", he is standing up and protesting even if he is harassed by the 'dogs' of the power. So I decided to award him the title of honorary Guide of Humanity.